Lee Selby says he is ready for a world title showdown with Carl Frampton. 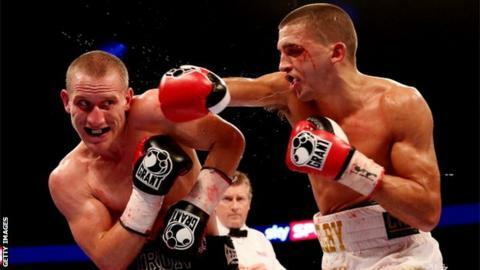 Welshman Selby was responding to being challenged by Frampton, who beat Scott Quigg via a split decision in Manchester to add the WBA super-bantamweight title to his IBF crown. "I will take on all-comers and I am more than happy to fight Carl Frampton," Selby told BBC Radio Wales. Selby will first defend his IBF featherweight title against Eric Hunter in London or Cardiff. Selby is ready to take on Frampton - who fights at four pounds lighter - later this year, but believes the pair should fight in Cardiff at the Principality Stadium, after Frampton stated the case for Windsor Park in Belfast. "Currently my full concentration is on Eric Hunter, my mandatory challenger. He is a great fighter and I am up against it," Selby added. "But as long as I come through the fight, I am happy to fight Frampton. "My options are open. Leo Santa Cruz has called me out as well, I am in a great position at the moment. "It would be nice to get one of those two fighters over to the Principality Stadium; that would be ideal." Selby, Frampton and Santa Cruz are all represented by Al Haymon in the US, which Selby thinks enhances the prospect of a showdown with Frampton. "All three of us are represented by Al Haymon so it should mean making the fights is a lot easier. It should be pretty simple." Selby also defended Frampton for adopting a cautious style in the Quigg fight. "You don't win more money for being hit in the face, the easier you can make the fight, the better," he said. "You want to prolong your career. Frampton boxed well."